The last couple of months have been basically taken up by the county of Yorkshire, all the illustrating work had something to do with the said county! 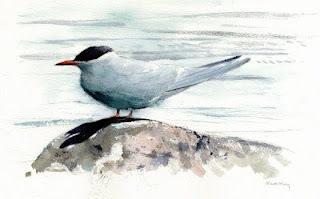 The image above of an arctic tern is for this years Yorkshire Bird Report published by the YNU and will be out later this year. I have a number of illustrations in this publication and am now coming to the end and near completion. This painting was watercolour and gouache on 300g stretched watercolour paper. With the end in sight I will be freed up to do some birding and field sketches.